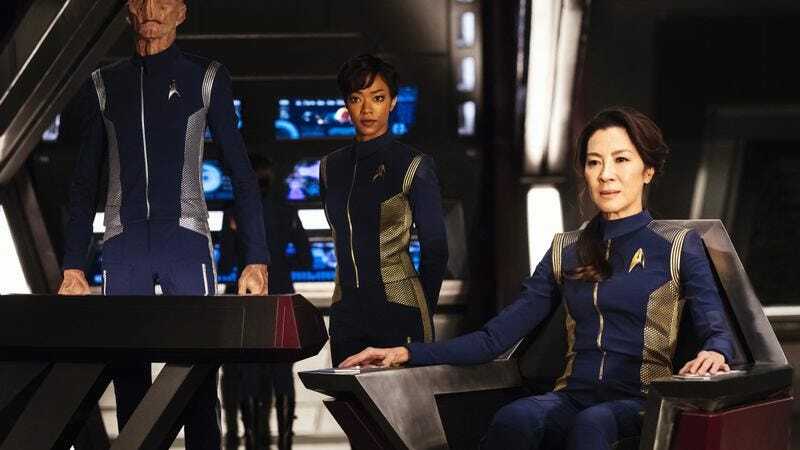 While we’ve slowly been getting more details about the cast and premise of the upcoming Star Trek: Discovery (and completed the five stages of grief over the loss of Bryan Fuller behind the scenes), with the first trailer for the series suggesting things were not looking good for the U.S.S. Shenzhou. More intriguingly, it also implied a potential Vulcan past for Sonequa Martin-Green’s first officer, albeit one still kept under wraps. Now, in a new interview with Entertainment Weekly, Martin-Green reveals some additional details about her character, Michael Burnham. As shown in the trailer, Sarek—Spock’s father—is a mentor of sorts to her, which creates a familiar Star Trek struggle. “I have the Vulcan conflict in my life from Sarek and Amanda so there’s always going to be that inner conflict with me. But I think it’s relatable because we all have some kind of inner conflict going on—who we are versus who we present ourselves to be.” In conclusion, Martin-Green adds, “There’s a lot to be discovered,” perhaps because CBS marketing execs have drilled sound bites directly into the casts’ souls.